Tropical Tacos! If you put mango on something, does it make it tropical? It does in my book. Sorta like when I put kiwi on anything and call it New Zealand inspired. It’s not, but it is. 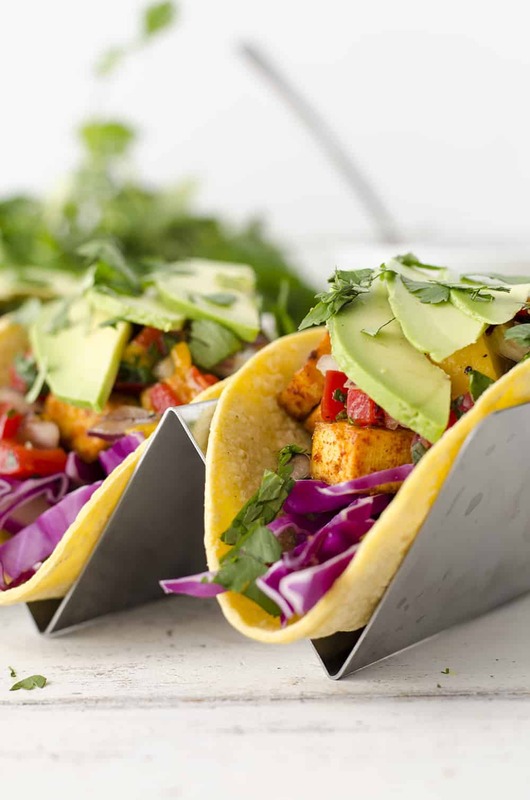 I made a version of these topical tofu tacos last week on Great Day St. Louis and while the cast & crew ended up loving them, there was some initial hesitation when they were first brought out. I get it, cauliflower tacos aren’t exactly mainstream.While the cauliflower was really good in that version, I altered the recipe just a bit using tofu and fresh avocado slices instead of the creamy sauce. I ate three of these tacos at the studio then came home, made a different version and ate three more. Further proof that tacos are quickly becoming my favorite thing to make and eat. The build-up of textures and the overload of flavors make these tacos a winner. 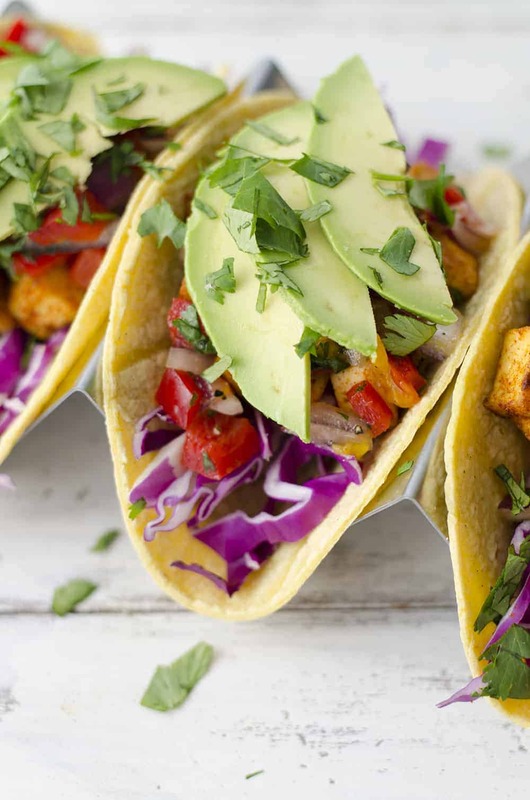 Spicy tofu chunks, crunchy cabbage, bright mango salsa and creamy avocado slices to finish. My recipe goals are fairly simple: increase your vegetable intake and make you forget that you’re not eating meat. These tacos do just that and more. Plus, all that gorgeous color? Makes these the perfect taco to enter spring with. I’ve been cooking tofu for a long time and have picked up a few secrets along the way. The first is my two-step bake then saute process that I share in this buddha bowl recipe. It really does produce the most phenomenal tofu evidenced by many 5 star ratings and me saying so. 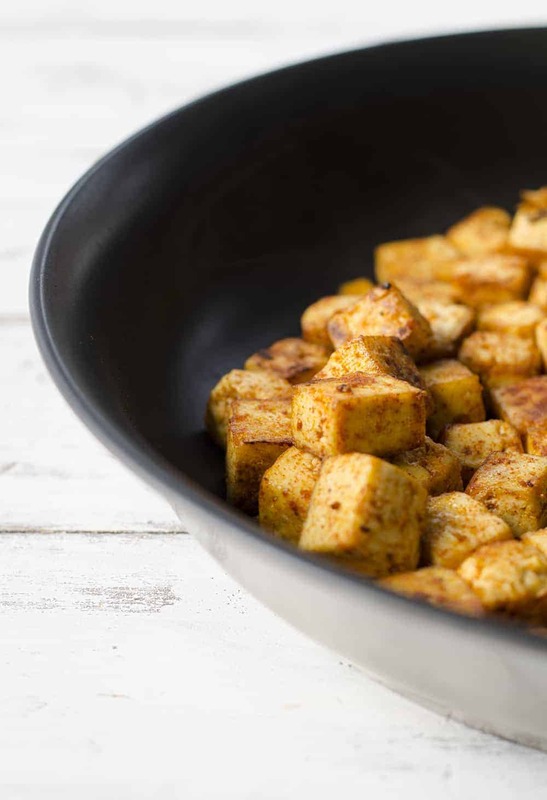 The second trick is frying tofu cubes in a cast-iron skillet. Even though my cast-iron skillet has been with me for almost 10 years and is very seasoned, I still use a little bit of oil when I’m frying tofu. You won’t regret it! Add the cubes into the heated pan and let sit for a minute or two to form a crispy crust. Gently stir, arranging again in a single layer and repeat. 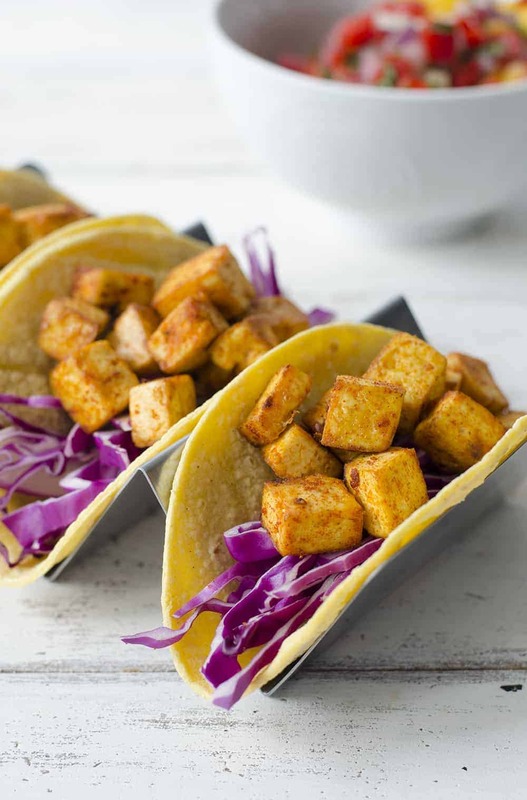 Do this another 1-2 times and you’re left with seasoned, lightly fried tofu that’s ready to be piled into these tropical tacos! I’ve tried this method with my stainless-steel pans and non-stick skillet but neither can produce the same results as a cast-iron. If you don’t own one, what are you waiting for? You can grab one for less than $30 and it will last for decades. Lastly, don’t skip the avocado! You can make the creamy, smoky sauce that originally went with this recipe or a few slices of avocado if you’re lazy like me. 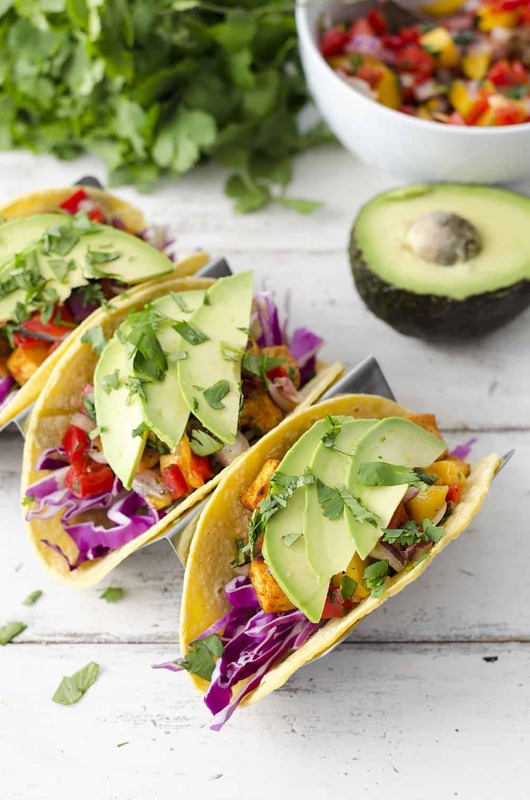 Either way, these spicy tacos really come together when balanced with that creamy, smooth texture! Fellow texture fans, you understand what I’m saying. To make taco night even more fun, aren’t these holders the best!? I picked up a few on a whim and now I want to put everything on them. No more filling spilling out all over your plate! Add the oil, tofu and jerk seasoning and saute for 8-10 minutes, stirring often, until tofu is browned and slightly crispy. While the tofu is cooking, prepare the salsa. 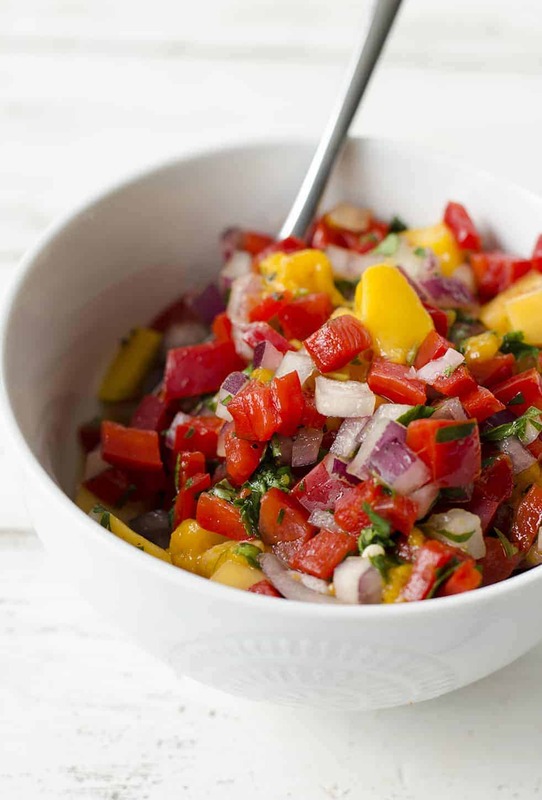 In a medium bowl, toss together the chopped mango, onion, red bell pepper, lime, cumin, cilantro and pinch salt/pepper. Season to taste and set aside. Warm the tortillas. You can do this in a non-stick skillet, in the microwave or in the oven. I like to lightly fry the tortillas in a dry skillet, but whatever option works best for you). Assemble the tacos! Layer the cabbage, jerk tofu, mango salsa, avocado and a few squirts of hot sauce. Love this! 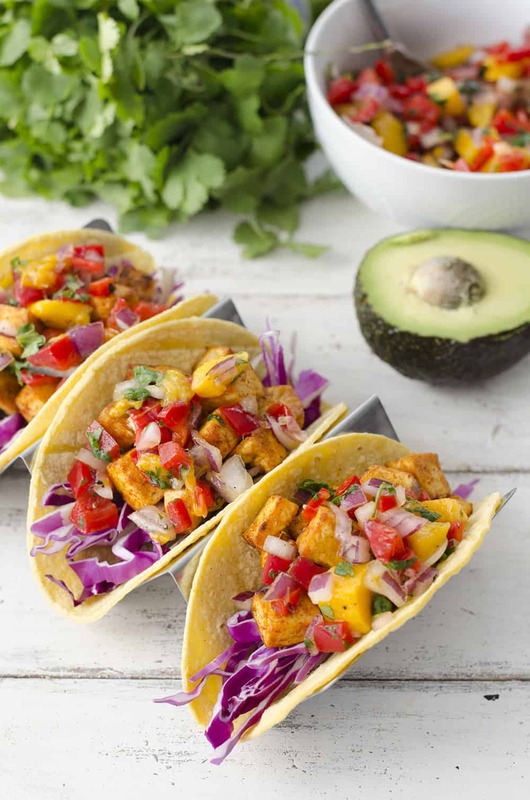 I am on a huge mango kick right now, and your tofu photos lately have me wanting to try this again! Going to Sprouts today, it’s on my list! Stay tuned! Eat the rainbow! <3 these look AMAZING! Yum! Now that the sun is out here this week, I’m craving fresh, colorful meals like this!